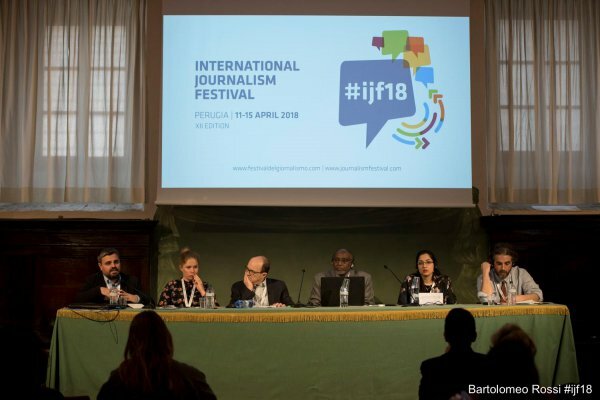 On 14 April 2018, Mona Silavi, UNPO’s coordinator for freedom of religion or belief, delivered a speech during the International Journalism Festival taking place in Perugia, Italy, the largest media event in Europe. The International Journalism Festival has been taking place for the past twelve years. Every year, independent journalists and activists from all around the world gather to discuss news and events that are not covered by mainstream media. This year, from 11 to 17 April 2018, more than 700 independent journalists and activists participated in the festival. The speech of Mr Abdirahman Mahdi is enclosed to this article. Watch the full intervention here. On 14 April 2018, the Italian radio “Radio Radicale“ organised a panel entitled “Forty Years After the Nobel Laureates’ Appeal against Starvation in the World: what Development Policies for the 21st Century.” In this panel, speakers from various backgrounds talked about the importance of knowledge and access to information, shedding light on the necessity of making sure that any funds and aid sent to governments from undemocratic states are subjected to the right conditions to prevent human rights violations and corruption. One of the panelists, Mr Massimiliano Coccia, started his speech by mentioning the destabilising role that some countries such as Iran and Russia have in the world. After him, Ms Laura Harth, Radical Party representative at the United Nations, explained how 40 years ago, the Nonviolent Radical Party Transnational Transparty launched an Appeal signed by 113 Nobel Laureates to urge attention and investment from developed countries in countries threatened by starvation. While the action following that Appeal brought some solace at the time, we are still facing same threats, possibly on a much larger scale due to climate change and raging wars. In addition, according to her, the negative effects that many development and cooperation policies have had on large parts of populations in lesser developed countries, in terms of lack of respect for their human rights, for democracy and for the rule of law, can no longer be ignored. These issues need to be put at the centre of international debate now more than ever, especially as this year marks the 70th anniversary of the Universal Declaration of Human Rights. Then, French Senator Mr André Gattolin stressed the fact that environmental crises lead to huge internal displacements of people in different regions within the same country. However, as we do not see these phenomena directly, we do not call these people climate refugees. Unfortunately, poor people compete with each other for limited resources, and a new approach and view on our development policies is needed. UNPO Representative Ms Mona Silavi commenced her speech by introducing the audience to the oft-forgotten national diversity of Iran stating that the country has an ancient history of exchange with the Romans, but that Italians nowadays do not seem to perceive that Iran is not synonym with Persia and making this assumption is not fair to other nations living in Iran. Indeed, in Iran, there are at least 5 major large nations in addition to Persians: Azerbaijani Turks, Kurds, Balochi, Ahwazi Arabs and Turkmens. In 2012, the Iranian former minister of education Mr Haji-Babyi stated that up to 70% of Iranian students who start elementary school have a different mother tongue than Farsi. However, in Iran only one language has official status and children must learn read and write in that language. In the panel on the situation of national minorities and relations of the Iranian government with Western countries, especially after the nuclear deal, Ms Silavi added that European experts who visit Iran are not authorised to visit the whole country but mostly Tehran and Isfahan, while they did not get close to Ahwaz which for the first 6 months of this year had only one “clean day”. Europeans also do not know much about lake Urmia, which was covered by a UNPO Conference in 2015. Sometimes, they are allowed to visit Azerbaijan, but for instance, never Balochistan, which is one of poorest areas, or Kurdistan where parts of the territory as these lands are covered in land mines from the Iran-Iraq war. The government never demined these areas under the pretext of securing borders. Most of the victims of landmine explosions are Kurdish and Arab children who live in border cities of Al-Ahwaz and Kurdistan. Moreover, Ms Mona Silavi also added that whenever European experts come to Iran, they do not understand the complexity of the situation, and they do not feel responsible for the policies of the central government. When they are told that they are helping the regime to oppress its minorities, they reply that they are simply doing their job. Separatism is used as an excuse to suppress social and cultural rights of national minorities. 'Helping' Iran in this manner not only divides the country but it will also delay the process of democratisation of the country and the whole region. Mr Abdirahman Mahdi, co-founder of the Ogaden National Liberation Front (ONLF) and UNPO Vice-President Mr Dolkun Isa spoke about the situation of minorities within Ethiopia. The conclusion was that the whole world must come to the understanding that secure, peaceful, stable states are capable of meeting the needs of their peoples and should therefore be able to live in peace and symbiotic relationships with their neighbours. Mr Mahdi added that a controversy surrounding the conditionality of international aid lies in sovereignty: many states claim that it is important that a country’s sovereignty is respected regardless of its economic status or need. However, according to Mahdi, it is unclear whether this is the sovereignty of the ruler or the sovereignty of people. Countries abusing human rights should not be allowed to shield themselves behind sovereignty and “internal matters”. The last panelist, Professor Vittorio V. Alberti, Italian philosopher and author, focused on the concepts of development and progress and on how misunderstandings relating to these two concepts have generated problems on the socio-political level. He also focussed on whether development should just be seen in terms of financial aid, or rather human development as well. Similarly, climate change is not a mere ecological problem but a socio-political one and it is important not to look at these two issues separately but as a whole. Another example is the issue of minorities: they make the majority but are not acknowledged by the government. Here, knowing the history of the places becomes a necessity.